Let's get this straight Donny Little Hands...are you going to release your damn taxes or not? 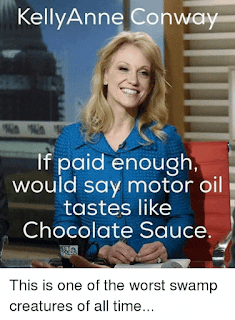 Your puppet Kellyann Conway told ABC last week that "People didn't care about seeing your taxes. They were litigated throughout the election." She wrongly claimed "Most Americans are very focused on what their tax returns will look like while President Trump is in office, not what his looks like." A national poll conducted by ABC showed 74% of Americans would very much like to see what's in Trump's wallet. Republicans and Democrats. Conway was later cornered by respondents to a petition on the White House website calling on you to “immediately” release you're tax returns. So she flip-flopped the very next day. Why the reversal Donnie? Should we believe what your puppet Conway is now saying, that they'll be released after the so-called audit is done? One question however. Why don't you release the paperwork showing us you are being audited? We just have your slippery words of assurance that there is an ongoing audit. One more thing. The IRS has repeatedly said you are free to release your taxes anytime. And if there isn't an audit...what have you been hiding?? ?